Celebrated Motown writer and producer Lamont Dozier has released an album covering his greatest works, with help from some famous friends. As one third of the Motown song-writing and producing trio Holland-Dozier-Holland, Lamont Dozier is, by account of their hit records, one of the most successful songwriters of all time. Along with Brian and Eddie Holland, Dozier was responsible for some of the greatest soul and pop hits of the twentieth century. Holland-Dozier-Holland, also known as ‘H-D-H’, helped to perfect the fabled “Motown Sound”, writing and producing hits for the likes of the Four Tops, Martha Reeves & The Vandellas, Mary Wells, The Marvelettes, Marvin Gaye, The Isley Brothers, Brenda Holloway, The Supremes and many, many more. Of the 12 Number 1 hits The Supremes recorded, 10 were written and produced by H-D-H.
And that was just in the decade or so that the trio spent at Motown. Once they left Motown they formed their own label, and scored hits with Chairmen of the Board and Freda Payne. Dozier would eventually start recording and performing himself, releasing the soul classic ‘Why Can’t We Be Lovers’ along with other lesser-known, but equally brilliant tracks, such as ‘Fish Ain’t Biting‘, ‘Take Off Your Make Up‘ and the original version of ‘Going Back to My Roots‘. He also crafted hits for Phil Collins (‘Two Hearts’) and Simply Red (‘You Got It’), and co-wrote with Collins the last Four Tops hit ‘Loco In Acapulco‘. All in all, Lamont Dozier is a seriously impressive man whose mark on American soul and pop music is so great it’s difficult to comprehend. Today, Dozier is 76 and is once again reflecting on his glory days at Motown, releasing his new album entitled Reimaginaton, a collection of covers featuring him and some very special guests performing his greatest hits. 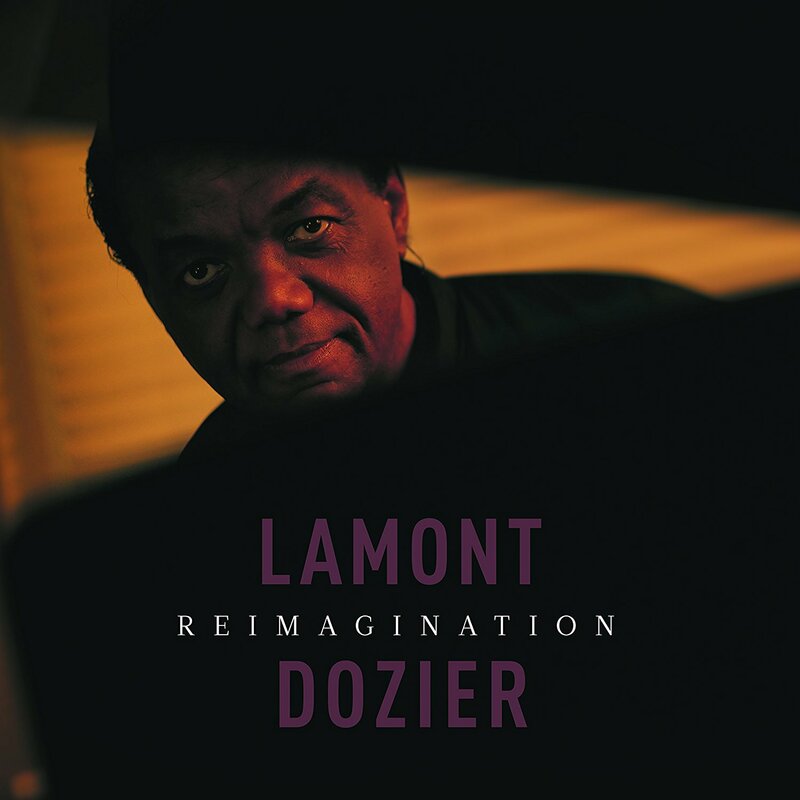 Lamont Dozier’s new album, Reimagination. This isn’t the first time that Dozier has covered his own work. Back in 2001 Dozier released An American Original, an album covering his Motown-era work, containing a similar selection of songs to Reimagination, but with a heavier focus on slick R&B grooves. The album was retitled as Reflections of Lamont Dozier for a digital re-release in 2004. An American Original/Reflections was an okay album, but most of the song arrangements sounded so much alike that they blended into one. Part of the H-D-H magic at Motown was their ability to craft an overarching sound (the “Motown Sound”) but nonetheless give each of their artists their own uniqueness. A Four Tops song shared similar traits to that of a Martha Reeves song, but they also were distinct enough to tell them apart. Unfortunately, the production on Reflections failed to achieve this. Fred Mollin, Dozier’s producer on Reimagination has in part learnt that lesson, and instead of using generic R&B grooves, he has opted for more stripped back, largely piano based, arrangements of Dozier’s biggest Motown hits. The result is more pleasurable than Dozier’s previous attempts to cover his own work, making Reimagination one of Dozier’s strongest and most sophisticated solo works. Firstly, it must be said, that Lamont Dozier remains in fine voice. In fact, his voice has aged remarkably well, sounding just like it did back in the seventies and eighties on previous solo albums. It’s hard to describe his voice, but it’s one of the most distinctive in soul music, being sensual and smooth yet still gruff in places. Dozier possesses one of the forgotten great voices in soul. Thankfully, Mollin’s new arrangements on Reimagination allow Dozier’s voice to shine through, re-imagining these Motown hits of the sixties. Something else Reimagination has over it’s predecessor is an impressive list of collaborators, including Graham Nash, Gregory Porter and Sir Cliff Richard. Interestingly, although Dozier and Mollin have included these guest stars the album can’t really be called a “duets album” as the guests mostly perform backing duties, a line here and there and a few ad libs. It’s Dozier who handles the majority of the lead vocals, and given the strength of his voice it’s a wise choice. The album opens with a ‘Supremes Medley’, comprising of ‘Where Did Our Love Go’, ‘Stop! In the Name of Love’ and ‘Baby Love’. Graham Nash features in the backing vocals, although his contribution is placed fairly low down in the mix. Unlike the uptempo original versions, Mollin and Dozier have opted for a much slower tempo for these songs, and for much of the album more generally. This has the effect of adding a sense of poignancy to the songs and the lyrics that was perhaps somewhat lost in the original Supremes’ versions. This is helped further with Dozier’s pleading vocals, which contrast with the relatively straightforward performances by Diana Ross on the originals. Dozier also takes a stab at two other hits originally recorded by The Supremes, ‘You Keep Me Hanging On’ and ‘Reflections’. On the former, British singer Rumer is enlisted to provide silky smooth backing vocals, and combined with Mollin’s gospel-tinged arrangement (complete with organ) and Dozier’s outstanding vocal, it becomes one of the album’s highlights. ‘Reflections’ is equally enjoyable, and features Scottish born singer Justin Currie. Dozier also covers four songs originally recorded by the Four Tops: ‘Baby I Need Your Loving’, ‘Bernadette’, ‘I Can’t Help Myself (Sugar Pie, Honey Bunch)’ and ‘Reach Out (I’ll Be There)’. Country music icon Lee Ann Womack performs with Dozier on ‘Baby I Need Your Loving’, her voice fitting surprisingly well with Dozier’s soulful tones. ‘Bernadette’ is given an acoustic makeover, while ‘I Can’t Help Myself’ features Dozier and just a piano for accompaniment. However, it’s ‘Reach Out (I’ll Be There)’ that is the highlight of the four Four Tops songs. We’re given two versions of the song, one featuring British singer Jo Harman and one without. The versions share the same arrangement and vocal by Dozier, but the version with Harman is much more enjoyable thanks to her powerful vocal. Unlike the guest spots on the other tracks, Harman is given a proper duet with Dozier and it pays off. It’s the best track on the album. Harman also appears on a medley of Holland-Dozier-Holland songs written for Martha Reeves & The Vandellas. Dozier revisits two of Martha’s greatest hits with a medley of “(Love Is Like A) Heatwave” and “Nowhere to Run”. Dozier and Mollin give these songs a tasty jazz makeover, perfectly suited to Harman’s voice. Gregory Porter, a jazz-pop icon in the making, features on ‘How Sweet It Is (To Be Loved By You)‘, although his contribution is limited, sadly, to a few ad libs and lines here and there, plus some backing vocals. The song is very pleasant, thanks to Porter’s ability to harmonize with Dozier and the bouncy, jazzy arrangement. But it’s still a bit of a shame that Porter’s incredible voice wasn’t featured more prominently. Perhaps the weakest collaboration on the album is with Sir Cliff Richard on a medley of ‘This Old Heart of Mine’ (originally by The Isley Brothers) and ‘My World is Empty Without You’ (originally by The Supremes). Dozier appeared on Sir Cliff’s Soulicious album a few years ago, and now it’s Sir Cliff’s turn to return the favour. Sadly for Sir Cliff, who is a year older than Dozier, his voice hasn’t stood the test of time quite as well. He’s given a couple of lines to sing and is relegated to backing vocals on ‘This Old Heart of Mine’, and doesn’t seem to feature at all on ‘My World’. Which is probably wise, as his backing vocals have been given the Brian Wilson (of The Beach Boys) treatment: triple tracked with perhaps a hint of autotune. It’d probably be best if Sir Cliff had stayed away from the studio. Refreshingly, Dozier doesn’t just stick to the well known hits. He’s included two songs which weren’t as big as the rest, but two nonetheless great songs: Martha Reeves & The Vandellas’ ‘In My Lonely Room‘ and Kim Weston’s ‘Take Me In Your Arms (Rock Me A Little While)‘. ‘In My Lonely Room’ is an excellent song, and Mollin’s dark and moody arrangement suits the song perfectly. Todd Rundgren also performs a nice guitar solo on song. Meanwhile, ‘Take Me In Your Arms’ is given a folk-rock feel (not dissimilar to what The Doobie Brothers did with the song in 1975) aided by folk artist Marc Cohen. All in all, Reimagination is a very good record from Lamont Dozier that sits alongside the best of his solo work. The stripped down production orchestrated by Mollin provide us with a new way to listen to these well-loved and frequently played classics. The album finds Dozier reflecting on his illustrious career, but it’s strength lies in these innovative new arrangements. It would have been easy for Dozier to just do straight covers, but by re-working these songs the results are much more impressive and enjoyable. Although the guest stars will (hopefully) help the album gain traction, most of the guests really aren’t needed; Dozier’s strong voice is all these songs require. That said, Lee Ann Womack’s apperance is surprisingly great and Jo Harmon’s performances on the Martha Reeves medley and on ‘Reach Out (I’ll Be There)’ are sensational. My only criticism is that I’d like to have heard more Gregory Porter. Looking at the songs selected for Reimagination it’s a reminder of just how successful Holland-Dozier-Holland were. These songs are just the tip of the metaphorical iceburg too: there’s probably enough H-D-H hits for Dozier to record at least two more volumes. Even more impressively, most of their success occurred between 1963 and 1967. It was a five year creative odyssey for H-D-H that not only cemented Motown’s position in music history, but also influenced the musical landscape in the decades that followed. Their unique brand of soulful pop, often imitated but rarely superseded, has lasted the test of time.